Although the night sky seems unchanging, it is in constant motion. Stars are not stationary objects but move through space, just like the Sun is moving along an orbit around the center of the Milky Way. A consequence is that all of today’s well-known constellations will eventually become unrecognizable (after a few hundred thousand years). Figure 1 The proper motion of a star is its apparent (angular) motion on the sky, which reflects the transverse component of its true motion (Figure from the RAVE collaboration). The apparent motions of individual stars on the sky are called proper motions (Fig. 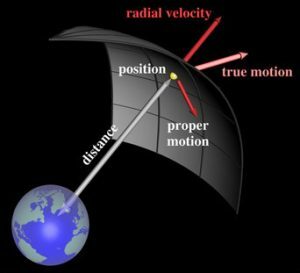 1) and the study of such motions is part of a field called astrometry. A revolutionary satellite dedicated to precision astrometry, Hipparcos, was launched in 1989 and provided a comprehensive catalog of the motions of stars in the backyard of the Solar System, which grew to include 2.5 million stars. Its modern successor, Gaia, was launched in 2013 and will reveal the motions of about a billion stars in total. 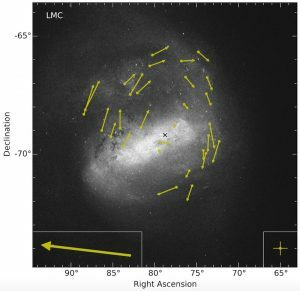 The authors of today’s paper focus on using Gaia to study the Large Magellanic Cloud (LMC). The LMC is the most massive satellite galaxy orbiting the Milky Way, and a prominent feature in the southern night sky. In the latest Tycho-Gaia catalog, there are 29 stars that have been identified as likely members of the LMC. The typical proper motion of these bright young stars is about 1.8 mas (or 2 millionths of a degree) per year, which corresponds to an actual velocity of around 430 kilometers per second at the distance of the LMC (approximately 50.1 kpc, or 6 times the distance to the Galactic Center). The measurement precision of 0.15 mas/yr is extraordinary, considering that 0.1 mas on the sky is roughly the apparent size of a frisbee on the Moon. The observed velocity pattern of the stars can be separated into a linear average motion and a clockwise peculiar motion (Fig. 2), which is evidence for a rotating disk structure. This rather large proper motion of the LMC and its internal rotation have already been found by previous studies (e.g. van der Marel & Kallivayalil 2014). It is testing the reproducibility of these results that is the authors’ main goal, as well as exploring the capabilities of Gaia. The authors have also performed essentially the same analysis on a completely independent data set obtained with yet another satellite, the Hubble Space Telescope. It is reassuring that the results indeed turn out consistent, which means that the underlying approaches are sound and that there are no lingering systematic uncertainties. The rotation curve inferred from the proper motion data also matches the line-of-sight (“radial”) velocities of other stars in the LMC. Taken together, these data sets can be used to estimate the distance to the LMC, based purely on observations of the stellar dynamics. Photometric methods, based on measuring the luminosities of stars (e.g. Freedman et al. 2001), yield more precise estimates (at least for now), but again two independent approaches lead to the same consistent result. Astrometry and the study of stellar motions in the LMC, the Milky Way and other stellar systems is critical in understanding their structure and history (see Lucia’s post on “The Fate of the Milky Way”). After the initial data release of the Gaia mission, this paper was one of the first to be submitted. And even though this data set is still limited, it immediately led to some new and exciting insights. All things considered, the wealth of high-quality data yet to be released certainly has the potential to revolutionize this field once again, starting in (fingers crossed) late 2017. Feel free continue reading Ben’s post on Gaia’s potential for finding exoplanets. Note: For additional information on the modeling of the LMC data, follow this link to a Python code that reproduces figure 2 above and a few other results from the paper. I am currently a graduate student at the Max-Planck-Institute for Extraterrestrial Physics in Germany. My main interest is in developing new tools for high-precision infrared astrometry, with the aim of learning more about the supermassive black hole at the center of the Milky Way and the stars in its vicinity.